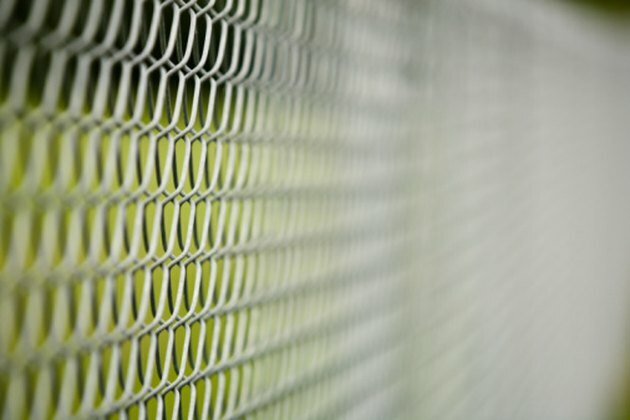 Although a chain-link fence makes an effective barrier, keeping pets or children inside a yard and trespassing people or animals out of it, the fence itself is not very attractive. Hide the utilitarian appearance of the chain-link fencing by planting landscaping along the fence. Vines can grow attractively along the fence and camouflage the chain link. Cover up a chain-link fence to make it more attractive. Select an annual or perennial vine to plant along the fence. Annual vines can grow quickly but require yearly planting to maintain coverage. Perennial vines create a more permanent cover for a chain-link fence, but choose a cultivar that will not become so large that it pulls down the metal mesh. Suggestions for annual vines include morning glory, black-eyed Susan and cypress. Suggestions for perennial vines include clematis, English ivy and Boston ivy. Prepare the soil along the fence by removing grass in a narrow 4- to 6-inch-wide strip, if necessary. Cultivate the soil down to a depth of about 4 inches, using the garden spade. Plant seeds along the fence line, spacing the seeds 2 to 3 inches apart. Some seeds like morning glory and cypress vines need soaking for about eight hours before planting to aid in germination. Cover seeds with about a half inch of soil and water evenly. Place plants in the ground, spacing them every 6 to 8 inches along the fence line, and water the soil well. Keep the soil evenly moist throughout the growing season to help the vines flourish. Train vines to climb the fence by weaving them in and through the metal mesh when the vines get long enough to reach up to the fence. Clean the mesh chain links with the wire brush. Rub the brush vigorously over the fencing to remove dirt and debris. Lay the tarp beneath the fence to protect the ground from paint drips. Apply paint to the chain-link portion of the fence, using a paint roller with a 1- or 1 1/2-inch nap. Cover the metal completely with paint that's dark green or black. Paint the posts with the paintbrush. Apply a second coat of paint, if necessary, to achieve even coverage on the metal.